Koket is an interesting brand. The furniture and lighting is very bold, not entirely to my taste when it comes to interiors, some of the pieces are too over-powering for me but I was reminded whilst at the Covet Lounge that this is not a brand that you would fill your house up with it is a brand that you would take one or two striking pieces and incorporate them into your design to be a talking piece, a show piece as it were in that room! The quality of the craftsmanship is what draws me to this brand, the intricacies and the details are of such that they deserve to be featured on this blog, I would love to know your thoughts on the brand. Please read on to learn more about the brand Koket and see for the first time on my blog a couple of behind the scenes production videos! Since launching KOKET in 2010, Janet has seduced the design industry with her sensuous designs. Never has the time felt more right for me than now to create a brand that is truly a personal reflection of who I am. Thru KOKET I will share ma joie de vivre and coquettish frill while empowering you to follow my lead and take risks to create your own sense of individual style—for yourself, your home and how you live. Fall in love with KOKET & let me empower you thru my collection. Who is the designer behind Koket? Janet Morais is an American interior designer and Creative Director of the young brand KOKET | Love Happens. Highly influenced by the decorative arts, fashion, flora and fauna, she brings bold and daring creations to life. Her Guilty Pleasures and Exotic Opulence Collections can be seen in projects of leading international companies such as the US luxury department chain Saks Fifth Avenue; the world’s most famous department store Harrods in London, and even in the set design of a major Universal Studios production, the 50 Shades of Grey movie. Each year Janet is recognized for her lavish design exhibitions in the most popular trade shows in New York, London, Paris and Singapore. Born in New York, raised between Europe and the US, Janet’s deep familiarity with the European culture have uniquely positioned her at the center of the evolving international luxury brand market. Top design publications such as ELLE Décor, Architectural Digest, LUXE Interiors + Design, Vogue and CS Interiors, have featured Janet Morais as a trend designer to follow. What inspires Janet with her creations? The perfect night in New York City is the inspiration behind Love Happens. Love happened over a simple sketch of a chair in a New York City lounge over cocktails. As the grace of the pen took to the paper the desire to possess and create other pieces with the same empowerment became euphoric. The man drawing the chair is now her husband. Highly influenced by the decorative arts, fashion, flora and fauna, Janet brings bold & daring creations to life. This unique sensibility is fuelled by the designer's unique European sophistication, which she has nurtured since she was a child. As an Interior Designer Janet creates perfectly curated interiors, as KOKET’s Creative Director her mission is to create highly desirable and empowering statement pieces. KOKET offers a glimpse into my world and everything that moves me. It is all of what I believe in, where I have been, and where I will take the brand will be closely tied to my personal growth. I am comfortable taking risks —and often, turning heads and commanding attention. KOKET is not about design trends or fulfilling design voids. It is a highly edited collection—not just of pieces of furniture, but a collection filled with the experiences, simples pleasures, passions and life events that have shaped me. What is Kokets design aesthetic? KOKET design aesthetic is very dramatic, Janet is a perfectionist in all that she does, touch and say. She has an instinct of trends to come and what people want, her mission at KOKET the brand is to inspire her staff to pursue their creativity and perfectionism to its maximum and create highly desirable and empowering statement pieces and present them to our audience in a show stopping way. Love must happen when our clients come in contact with our brand. The Nymph chandelier is a particularly beautiful piece, could you tell us a little more about the design inspiration and the process in which it is created? 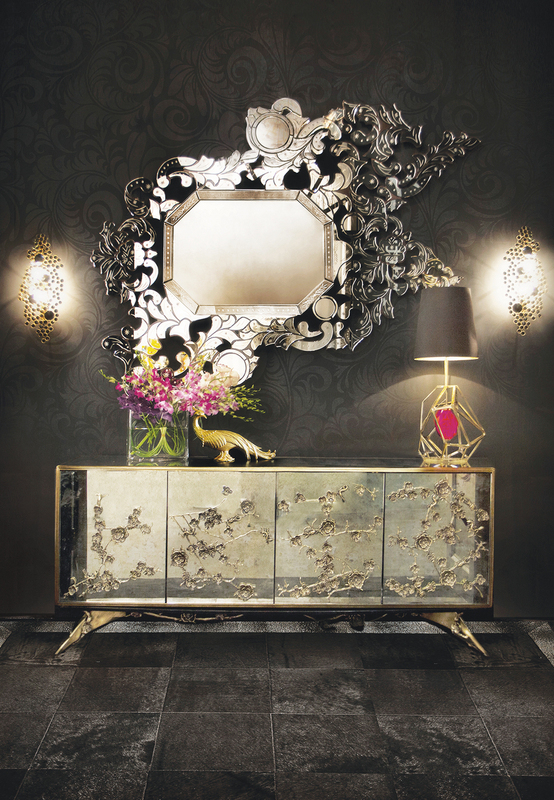 The Nymph chandelier is an innocent drama of a whimsical butterfly through the enchanted journey of life. It embraces the wild side of this rare and beautiful animal that so gracefully bejewels the lighting fixture. Delicate brass butterflies hover in the air in perfect harmony composing an overblown dramatic silhouette, which gives shape to a luxurious golden chandelier. Where is Koket’s design studio and production lines based? The Koket Design studio is composed of international talented designers reaching for the creation of empowering statement design pieces . Our design team is usually based in Portugal, next to our production line based. It is a complete work together. Is there anything new we can look forward to seeing from Koket in the near future? KOKET is expanding in to a premier life-style brand where we will go beyond furnishings & we are also launching a design studio offering design services to our retail clients. A new collection of Bed is one of our latest news : http://www.bykoket.com/all-products.php#beds, fall in love with this !